A Reusable Liner That Nothing Sticks To. Improve Results, and Make Clean Up A Snap. Stuff Points: Earn 10 points when you buy this stuff. Stop using oil and butter to prevent sticking, but don't resort to wasteful products like parchment paper and foil either. 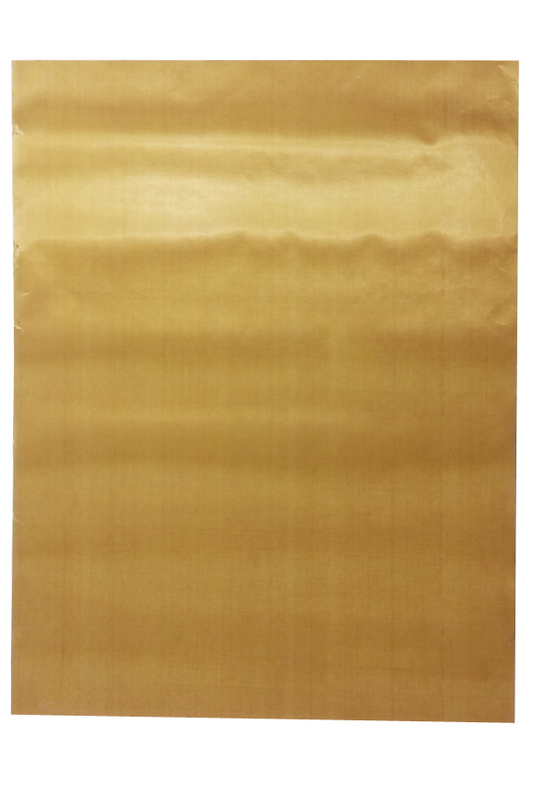 This commercial quality sheet is constructed from premium materials, and it's built to last. Bake cookies and pastries that lift up easily, prepare cakes and brownies without any shortening, or use it as protective surface to collect drips and splatters. The advanced material can be used for food prep, cooking, baking, or protection. It can be cut to size, and it's totally bendable and flexible, so it will easily adapt to any surface, pan or dish. Once the cooking is done, food will slide off easily, and clean up will be simple. Sticky sauces, sugary candy, melted cheese and other notoriously messy foods will never glue to the surface, and in most cases, will wipe right off with no effort at all. Its made in Sweden, and it's comprised of a woven glass fabric that is coated with five layers of high quality PTFE. It's far more versatile than silicone, and it works better and lasts longer than other products made from similar materials. Once in place it will protect the surface underneath, and distribute heat evenly to the food above. The end result will be professional looking pastries, low fat dishes and effortless clean up. Each sheet is totally reusable, and in most cases will last for 1000 or more uses. High Quality. Made in Sweden using superior materials, this sheet will work better and last longer than the competition. The unique construction, and thicker coating allow for improved perform when compared to other versions. Commercial Quality. Designed for professionals, but priced for the home user. No other similar mat will hold up to as many uses as this one, and the performance is difficult to match. Look like a pro each time you use it. Nothing Sticks. Sticky sauces, gooey cheese, sugary candy, it doesn't matter. Nothing will stick to this material, so delicate foods will be easy to remove, and any amount of mess will be quick to clean off. Reusable. Easily wash when finished, and use it over and over again. Most people will get more than one thousand uses out of a single sheet. Versatile. It's perfect for placing on to of a baking sheet, but that's just one of many uses. It also works well to line any other pan or dish, and it's ideal for catching drips and preventing messes. Eco-Friendly. Use instead of foil, wax paper or parchment, and have nothing to throw away afterward. This sheet works just as well or better than those traditional options, but you can wash and reuse many times over. Healthy. Because you won't need oil, butter or shortening, you will reduce the fat content of your food, and serve a healthier dish. Protective. Keep your pans and oven clean, and let this sheet get dirty instead. When used regularly, it will prolong the life of your dishes and appliances, and more importantly, it will reduce the amount of time you spend cleaning them. Even Heat. When spread out under your food, this non-stick sheet helps to distribute heat, evenly across the bottom of your food. When cooked with even heat, the end result will look and taste better. Easy To Clean. A single swipe will wipe most food right off the surface. This versatile tool has so many uses that it will quickly become a favorite in any kitchen. You could just use it anytime you cook a batch of cookies, or you could maximize the value by using it for other stuff too. As a protective covering for cookie sheets, it's tough to beat, but once you try it for other tasks, you'll wonder how you ever survived without it. Cooking - Use at the bottom of any cookware to eliminate the need for butter and oils. Simply place it inside, and then pile food on top, and it will cause your dish to release easily when finished, and it will also keep the interior clean. 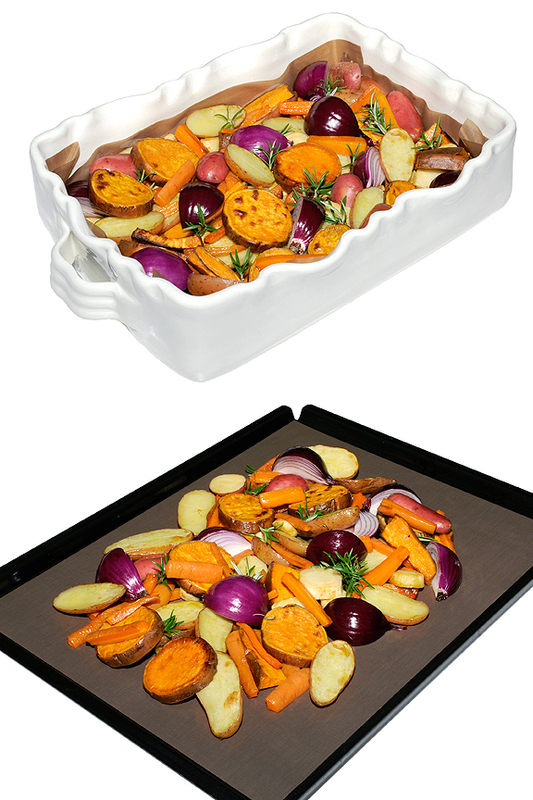 It's perfect for stews and roasts, and once inside it will also help to spread the heat evenly across the food on top. Baking - It's the perfect size to use on standard baking sheets, but you can also cut it, or stuff it for use in smaller dishes and cake pans. Instead of greasing before you plop the dough down, or slathering shortening before you pour the batter, just line your bakeware with one of these. Your finished pastry will cook perfectly and come out easily. 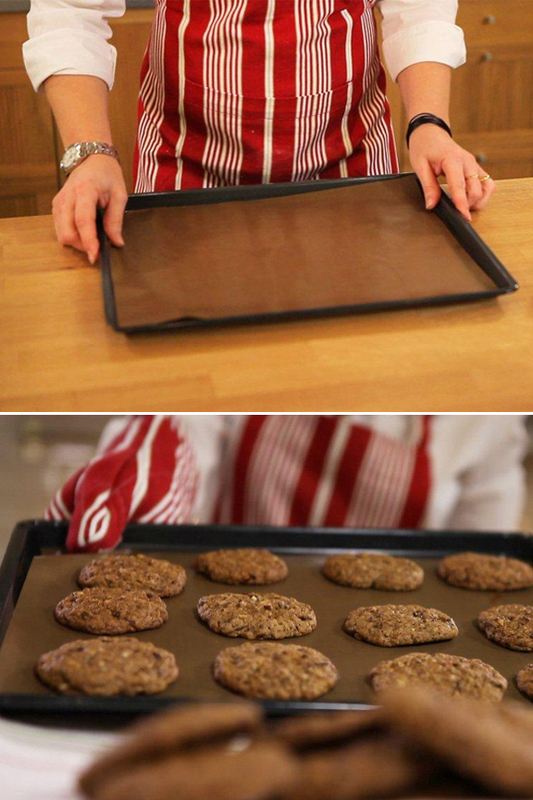 Oven Liner - Because cooked on food slides off with ease, these sheets make the perfect liner for the bottom of your oven. Just place one on the bottom rack, and any overflows or drips will collect on the stick-proof surface for easy cleaning after you finish. It doesn't matter if it is cheese, batter, chocolate or anything else. Just remove when cooled, and then hand wash or place in the dishwasher for cleaning. Microwave - Catch all of the splatters and bubbled over food in your microwave too. Cut into the shape of a circle to cover the rotating plate at the bottom, and never worry about a dirty microwave again. Any food that would normally glue itself to the interior will be collected and easily cleaned thanks to this sheet. You can even use it to cover a dish of pasta to contain the explosions of sauce and keep all of the red stuff in the bowl. Toaster Oven - Just like regular ovens, the mini versions also have racks that let food drip through. Cut to size, and then use this sheet to line the bottom rack. It will catch all of the drips and keep the interior clean. You could also use it right on the rack with your food to keep the surface clean and stop drips before they happen. This non-stick baking sheet performs better than silicone versions, and it's about half the cost, overall. The thinner, more versatile material allows for a wide variety of applications, and heat transfers better, so browning on the bottom isn't a problem. When compared to other PTFE sheets, this one will be more effective, and it will last longer. Use it under any food you are cooking to prevent delicate foods like fish and pastries from falling apart, or gooey stuff like cheese and chocolate from sticking. It cuts easily to adapt to any shape or size pan you are using, and because it's thin, it even works well in glass bake-ware and casserole dishes. The safe material is totally BPA and PFOA free, and it has been approved by the FDA for use in home and commercial kitchens. The standard sizing allows it to fit perfectly on a cookie sheet, but the sky is the limit as far as additional options for use. Save money, reduce effort and look like a professional baker. Please Note: Avoid the use of sharp instruments on the surface, as it may result in permanent damage. To clean, hand wash with soap and a damp cloth, or place into the dishwasher. Uses Add a non-stick lining to almost anything to improve quality of baked goods, and allow for easier clean up. A healthy alternative to oils, a less costly alternative to parchment, and a more versatile material when compared to silicone. Re-size-able Yes. Cut to any shape or size. FDA Approved Yes. Approved for home and commercial use. Reusable Yes. Get more than 1000 uses from each sheet. Compatibility Safe for use almost anywhere. Use to line glass or metal bakeware, use to catch drips at the bottom of your oven, use to prep food without sticking and more. A money saving alternative that will improve your finished product. Prevent stuff from sticking and achieve even heat distribution with this flexible and reusable sheet. Order Yours Today! I love my non-stick sheets!!! The ones I received were black, not gold, but I'm assuming they are the same?! Either way, they work amazing! Nothing sticks to them, easy to clean and Eco-friendly. Deluxe Cake & Pastry Frosting Tools. For Professional Results! A Reusable Surface For Any Grill. Safe, Easy And Versatile. Fill Before You Frost With This Easy-To-Use Tool. A Small, Ergonomic Brush With Natural Bristles. Commercial Quality. 100% Pure Silicone. 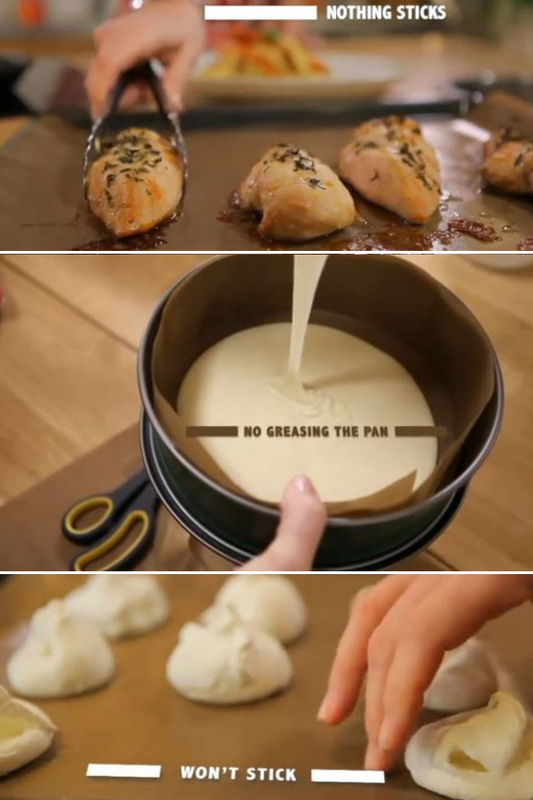 Bake Like A Pro!